Eweb offer a unique and innovative web design in newry, essentially looking at 2 core areas; website design from concept stage through to implementation and online marketing promoting the website after launch. Both being as important as each other. 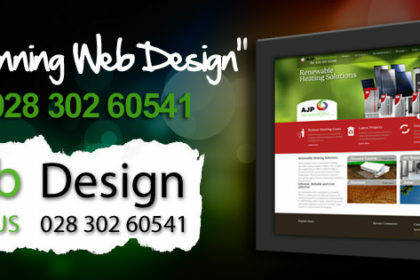 Concept is the first task and maybe the most important when we think about web design in Newry. This involves generating an initial design based on the customers requirements. Before jumping the gun we always do our research on the customer, the product or service and lastly the market they are targeting. What message is the customer trying to portray and to who? These questions will determine how we approach the website concept design, do we keep the website simple and easy to use or perhaps a more elaborate web where the user can navigate and explore. The user characteristics will be important, should the user be a relatively small internet user it is essential that the website is easy to follow. For more experience users we could introduce extra features that improve the experience. Projects aims and requirements will obviously have a huge impact on the design concepts. The client will have website targets may it be maximum sales, enhancing corporate image or simply establishing the brand. All would have a direct influence on the website theme, structure, even down to the colours and text. The development phase links concept design to website prototype. Client feedback is critical in the web design Newry process. We know how to development a website and promote it online but the client knows their own product and customers. Its vital that we consider this in the development stage. We work very closely with the customer, communicating and analysis on all the website facilities and features ensuring that all the right design choices are followed. What information does the customers need and which is the most relevant? What does the customer consider before the buy our clients products? How should we present all the content, is it all required or will the basics be suffice? Web design in Newry requires comprehensive testing. Testing will highlight the most obvious design weaknesses but not everything. Very often post website launch issues will arise that need addresses. Subtle issues that specific user types will have. The user diverse is so large now that it is impossible to test every scenario relaunch, so the first 4-8 weeks will provide a thorough testing even the website is already live. Mobile phone users may not have accessibility to all the website pages or full website features may not be available on certain internet browsers. So this is our strategy that applies to every website project we undertake. A customer orientated approach we refer to it as. Delivery a website that is accessible and easy to use for the targeted user. Presenting the right information in the correct format, so the communication is spot on. The targeted outcomes are being realised with the right call to action initiated.